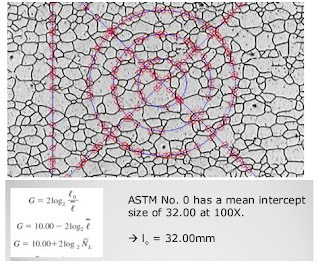 The following relationship may be used for determining the austenite grain size in steels. n is the number of grains per square mm as seen in a specimen viewed at a magnification of 100. (i) Comparison method, (ii) Intercept method, and (iii) Plamimetric method. 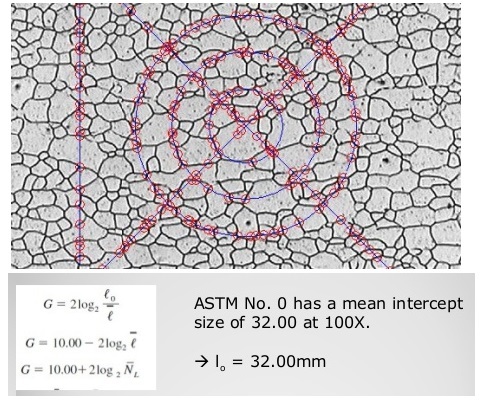 The grain size is measured by comparison in the comparison method, under a microscope with a magnification of 100 (after etching), with standard grain size ASTM charts. Usually grain size of steel are graded into eight classifications. Steel with grain size number from 1 to 5 are called coarse grained steels, whereas grain size 6 to 8 are fine grained steels. By trail and error absest match is determined and one note the grain size of the steel from the index number of the matching chart. A photo-micrograph is used in the intercept method. On any straight line, one can divide the length of the line drawn in mm divided by the average number of grains intercepted by it gives the grain size. This method is found suitable for non-equiaxed grains. 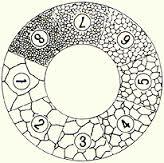 The last method, i.e., the plantimetric method, when used on a photo micrograph, indicates the number of grains per square mm in a drawn are of a circle or triangle. For most steels, first of all, the specimen is carburised at 930°C for 8 hours. On normalisation or slow cooling, the austenite grain size will reveal a cementite network due to the transformation of austenite into pearlite. The grain size prior and after the test remains unchanged, as the heating temperature of the standard test does not exceed 930°C.